The newspapers are filled with headlines such as ‘Romney ahead 50% to 47%’ or ‘Obama levels at 48-48’. Despite these national polls dominating our news, they are largely irrelevant. We should instead look at around eight swing states, with none more important than Ohio. Having only backed a losing candidate twice since 1900, whoever wins the Buckeye state is likely to win the election. The combination of the Electoral College system and America’s polarised politics means that around 400 of the 538 state votes are largely decided. With Obama leading amongst those, it is highly probable that he needs just 33 more votes to reach the magic total of 270. With Romney needing an additional 79, Obama has many more routes to the White House. The maths is simple: if Obama takes Ohio, Romney would need to win the swing states of Florida, Virginia, North Carolina, New Hampshire, and Colorado. He would also either need to win the Democrat-leaning Wisconsin, or both Nevada and Iowa. Despite some indications Romney could take North Carolina and Florida, winning these other 6 or 7 states would certainly be a tall order. The signs are good for Obama. The US Bureau of Labor Statistics put Ohio’s unemployment rate as proportionally better than the rest of the country, and better than other swing states Colorado, Florida and North Carolina. One in eight adult jobs in Ohio is in the car industry, the bailout of which has arguably been one of Obama’s biggest successes to date. The state polls also look good. Public Policy Polling put Obama at 52% to Romney’s 47%, while Columbus Dispatch give him a 50% to 48% lead. The Huffington Post and YouGov both give the President a 3% lead in the state, while Ipsos/Reuters put him ahead by 4%. Five-Thirty-Eight give Obama an 86.8% chance of winning the state. Only Rasmussen does not have Obama winning Ohio, putting both candidates on 49%. This lead is hardly iron-clad, and will certainly depend upon turnout. It is here that Obama’s grassroots strength will pay off. 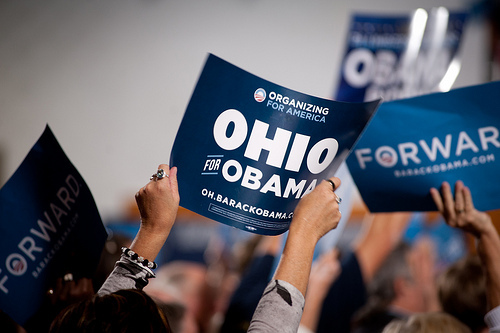 With over 130 Organising For America offices in the state, Obama has three times more campaign offices than Romney. The ‘Get Out The Vote’ initiative was the difference in 2008, and looks likely to be key again in 2012. Hopefully this will be aided by early voting, with initial indications suggesting Mr Obama has a 6% lead in the state amongst the 1.6 million Ohioan votes already cast. The candidates themselves certainly understand Ohio’s importance, with over $169 million spent on TV ads there and 83 visits to the state between them this year, a record in modern history. This is a history that is on the President’s side – a Republican has never won the presidency without carrying Ohio. If Mr Romney loses Ohio tomorrow, it is difficult to see him reversing this trend.